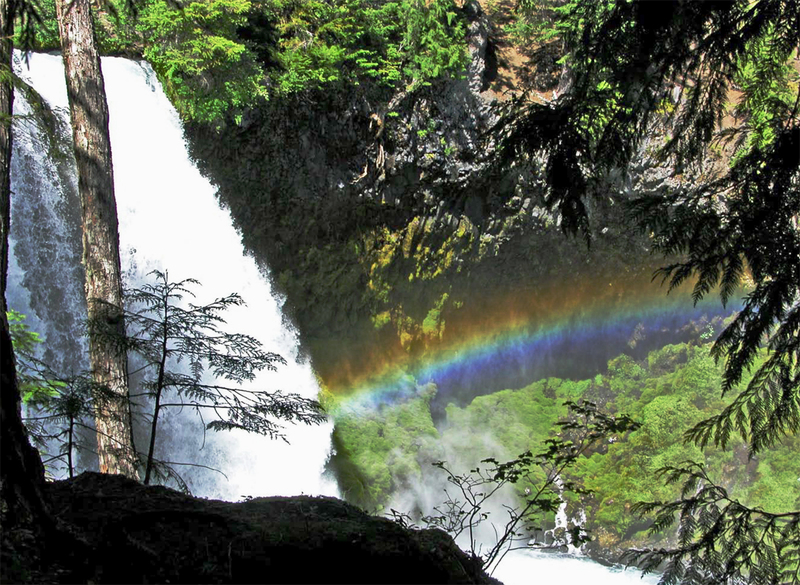 Another annual or bi-annual trail for us is the 3-4 mile Waterfall Loop Trail portion of the McKenzie River National Recreation Trail (click on the links for maps and more info). 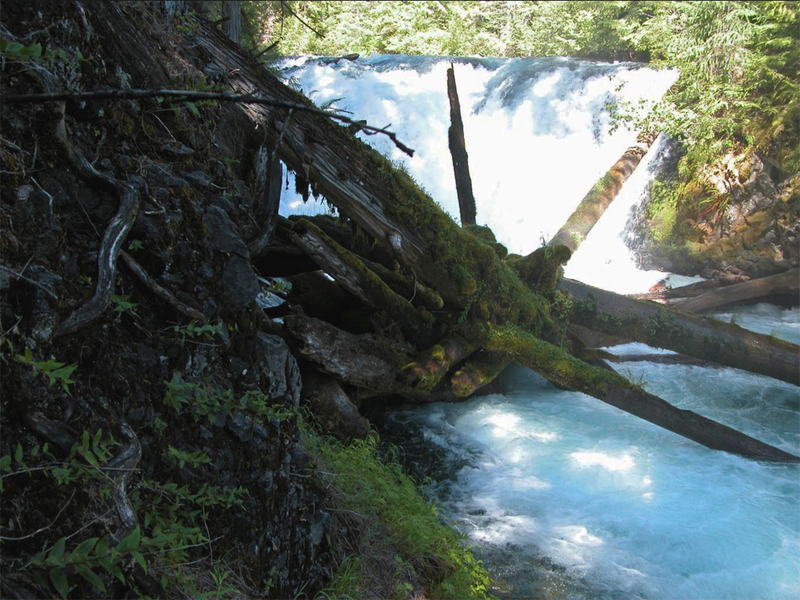 You can access this trail from the Sahalie Falls and Koosah Falls viewing points and make a loop of it from there. We like to park at Clear Lake, which makes for a slightly longer hike, but it adds just that much more to the experience, I think. Embarking on this trail from the Clear Lake Resort parking lot feels like you’re stepping into an ancient mystical forest. And as such, perhaps if you look hard enough and step quietly enough you’ll spy an elf scurrying along the forest floor or a glimpse a fairy flitting amongst the lush green foliage. So, okay, maybe there aren’t really any mystical creatures in this forest, but it sure feels like there could be, and even without that kind of deep-forest perks …. 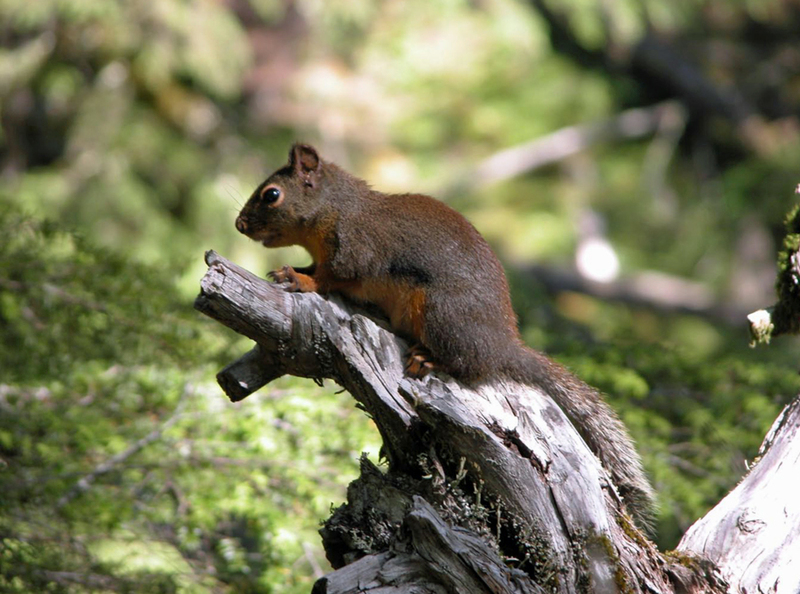 there certainly is a lot of wildlife to enjoy along the way. If you hike with a pooch and make an effort to keep that pooch in check, you’ll no doubt see loads of birds, small mammals, some reptiles and really cool insects (such as butterflies and dragonflies). The trail turns right out of the Clear Lake trail system and crosses over Hwy 126 after about a mile or so and that takes you to the McKenzie River-hugging trail portion of the hike which is well used by hikers, lookie-loos (aka ‘tourists’) and bicyclists. For some reason, hiking down along the trail on the highway side, walking with the flow of the river is a breeze. It’s cool, moist and refreshing and it moves along very swiftly. But (and see if this is true in your case) once you cross over to the other side and start hiking back against the flow of the river … it’s a lot more work. I can’t explain why that is other than maybe there is a slight elevation gain – but it really does seem easier to go with the flow. Regardless, it’s an extremely enjoyable trek and there are several spots along the way where you will want to sit and take in the amazing views including that of several falls, rushing river scenes and quiet pools. One thing to keep in mind when hiking with a canine; it might be tempting to your dog to jump in and take a swim – or to lap up some of that cool blue water. But – this is a very deep, very rapid river complete with a bunch of dangerous falls and log jams, so keep your dog on a leash or keep him very close by. It would only take a second to lose a critter, or a kid for that matter. There is a cool log-over-the-river foot bridge that leads from one side to the other of the McKenzie River at the upper part of the trail and it’s always fun to pause on that for a while. At the other end of the loop trail there is a reservoir where the river quiets down and you can take some time to enjoy a variety of waterfowl and fisher people alike. What you’ll see: tourists, hikers, hiker-dogs, bicyclists, birds, small critters and entertaining insects. That’s a very cool tee! Might I suggest that you visit our facebook page at: https://www.facebook.com/pages/Hiking-Central-Oregon/122592787754187 and post a comment there. As long as it’s not overly commercial I promise not to delete it. You’ll get lots of attention from that page, I promise!